We have had a busy month of event outreach, improving our quick start and FAQ material, and building out internationalization. The key focus was preparing for expansion in 2018. This was a significant month for outreach at the OpenChain Project. The OpenChain Project was featured at the SFLC Fall Conference on the 3rd of November. The talk, entitled ‘Update on OpenChain’, is available as a video under CC licensing. The OpenChain Project was highlighted at the EOLE conference in Paris on the 5th of November in a talk by Malcolm Bain of ID Law Partners. The OpenChain Project was featured at the Linux Foundation Legal Summit on the 5th of December. The talk provided an overview and context for how the OpenChain Project will position itself entering 2018. In preparation for increased outreach via our community, our members and our partners in 2018 the OpenChain Project released a new one page Quick Start guide. This activity is a progression of our Quick Start landing page and related activities from the OpenChain Onboarding Work Team. The OpenChain Project released additional slides via SlideShare to support new and existing participants in contextualizing and explaining our work. ‘OpenChain: Giving everyone access to open source best practices‘ provides a clear overview of why the project was formed, how it works, and where it is going. ‘Update on OpenChain: now we really begin’ provides a snapshot of our current status. ‘Standardising Compliance Processes’ from Malcolm Bain of ID Law Partners helps to frame OpenChain Conformance as a standard. The OpenChain Project has moved from translations to dedicated local activities with the formation of a Japanese Study Group. The first meeting will take place on the 27th of December at the Sony Headquarters in Tokyo. Registration for the event is now open and over 20 participants from multiple companies are already confirmed. 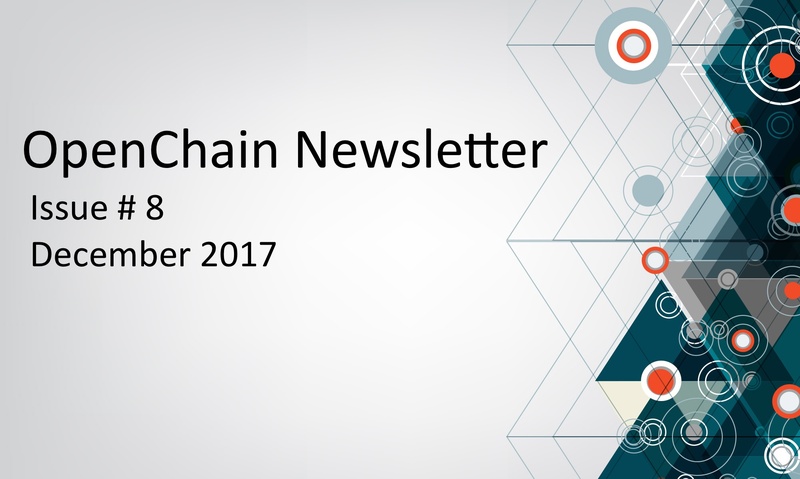 The OpenChain Project has had a significant year of growth in membership, growth in the community of conformance and expansion of our onboarding, curriculum and translated material. The last six months have seen a substantial focus on internationalization and positioning for member-driven growth in 2018. Our Japanese Study Group meeting on the 27th of December will provide guidance on measured, effective growth strategies moving forward.